Natural selection can occur with or without environmental change. In a constant environment, natural selection will keep a population stable and essentially maintain the status quo. The differences among individuals in a population. arises that is more advantageous, the new trait will be perpetuated and the species will evolve. The differences among individuals in a population. that result in a better fitness in the new environment, resulting in adaptation and evolution. A type of selection that removes individuals from one end of a phenotypic distribution and thus causes a shift in the distribution. occurs when natural selection favors one extreme of continuous variation. Over time, the favored extreme will become more common and the other extreme will be less common or lost. 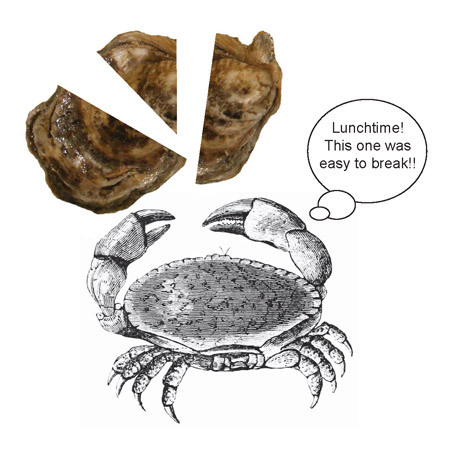 If thicker-shelled oysters are more resistant to breakage than thinner-shelled oysters, crabs will be less able to prey upon them, and thicker-shelled oysters will be more likely to survive to reproduce. A type of selection that removes individuals from both ends of a phenotypic distribution, thus maintaining the same distribution mean. occurs when natural selection favors the intermediate states of continuous variation. Over time, the intermediate states become more common and each extreme variation will become less common or lost. Continuing our oyster example, very light-colored or very dark-colored oysters might be more frequently preyed upon by shore birds, simply because they are more obvious on the oyster bar; as a result, the intermediate hues become more common. A type of selection that removes individuals from the center of a phenotypic distribution and thus causes the distribution to become bimodal. occurs when natural selection favors both extremes of continuous variation. Over time, the two extreme variations will become more common and the intermediate states will be less common or lost. Disruptive selection can lead to two new species. Coloration that allows an organism to match its background and hence become less vulnerable to predation or recognition by prey. (less easy for a predator to see) because they match the rock color. Dark-colored oysters blend into the shadows cast by the rocks. In this case, intermediate-colored oysters would be most heavily preyed upon by the crabs, and very light and very dark oysters would survive to reproduce. A type of selection that involves altruistic behavior, e.g., the protection of offspring, in which a parent acts to preserve the gene pool of offspring at the expense of itself. occurs when natural selection favors a trait that benefits related members of a group. Altruistic behaviors are a result of kin selection, and are best illustrated by animals with complex social behaviors. Worker bees exhibit altruistic behavior by spending their lives serving the hive while never having an opportunity to reproduce on their own. In terms of simple fitness, the worker bee does not reproduce and therefore the traits that allow it to be a worker should be selected against. However, because all of the bees in the hive are close relatives, a worker bee's genes will be passed to the next generation indirectly through the queen. The queen is able to produce many more related offspring than the worker alone. As a result, servicing the queen to allow her to reproduce a larger number of offspring results in a higher fitness for the worker bee even though it never reproduces directly. A type of selection in which the forces determined by mate choice act to cause one genotype to mate more frequently than another genotype.. Females of the Cumberlandian Combshell have a low bulge along the edge of the shell that accommodates enlarged gills for brooding larvae; males have more streamlined shells. The two sexes of a species having different shapes, sizes, etc., from each other. is when males look different than females of the species. Some of the most obvious examples involve animals that attract mates by virtue of their appearance, such as peacocks with larger, more flamboyant tail fans. The male that is most attractive will win the right to mate with the female. Over time, the features that most attracted the females will become more common. 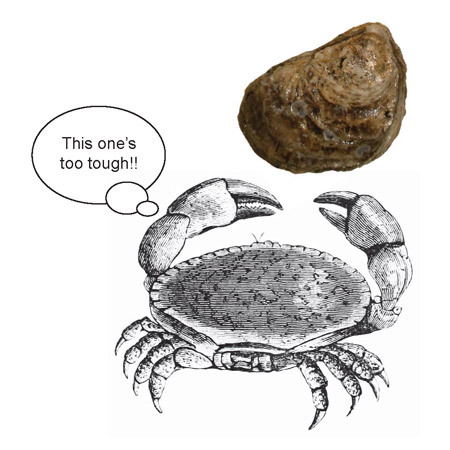 Some freshwater pearl mussels also exhibit sexual dimorphism, but obviously not to visually attract a mate. 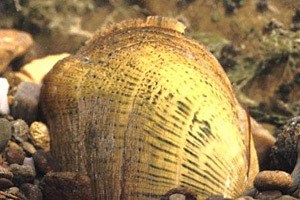 The endangered Cumberlandian Combshell (Epioblasma brevidens) of the American Midwest is a medium-sized (to 2 inches) mussel with an oval to quadrate shell. Female shells have a low bulge along the edge of the shell that accommodates the enlarged gills in which it broods its larvae; males lack this bulge and are more streamlined. In this example, females that have a larger bulge (= larger gills) might produce more offspring, ultimately leading to a population with females that have larger bulges and larger gills. 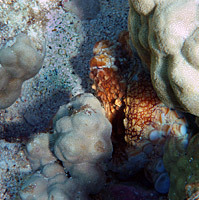 Octopus cyanea on a reef in Kona, Hawaii. As with appearance, males that have the most attractive mating ritual potentially win the right to mate with the female. Birds provide the best examples of complex mating rituals, often involving dances, vocalizations, and fluffed up feathers. Over time, the rituals most preferred by the females will become more common. There are no good examples of mating rituals among bivalves, but we can look to their relative, the octopus. 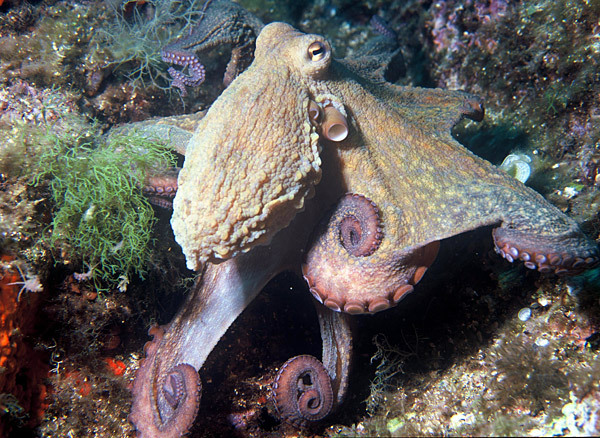 The Day Octopus (Octopus cyanea), found in the South Pacific and Indian Oceans, has an elaborate mating ritual that signals his mating intent to the female. The ritual involves arm waving and skin darkening as the male approaches the female. If the male is positively received, the female is inseminated by the placement of spermatophores into her oviduct through the use of his modified arm. The female then lays thousands of eggs inside her lair. In this way, successful male rituals are passed down to offspring; males whose displays fail to attract a mate do not produce offspring. Find more information about the Day Octopus here. 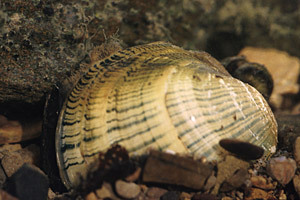 The Wavy-Rayed Lampmussel (Lampsilis fasciola), of the American Midwest, has an elaborate lure display. Watch a video produced by North Carolina State University here. Posterior extensions (usually two) of the mantle through which water is directed in and out of the body, along with waste products and gametes of bivalves. (adj. siphonal) — called a “lure” — that flutters in the water to attract a fish. When the fish draws near the lure (thinking that it might be something to eat), the mussel releases a cloud of glochidia, which then attach to the fish. Conceivably, females with lures that are more effective in attracting fish will produce more offspring. See more about this specialized reproductive mode under Life Cycles in the section The Evidence for Evolution: Developmental Biology. The Common Octopus, Octopus vulgaris, is found worldwide in tropical and semitropical waters from nearshore shallows to as deep as 200 meters (over 650 feet). It is one of the most studied invertebrate animals. In species with males that battle over rights to mate with females, such as elephants and deer, the male that wins a fight because he is the strongest, most dominant, or most intelligent will win the right to mate with the female. Over time, the features that allow the males to win (larger tusks, larger antlers, larger body size) will become more common. We again look to the octopus for a molluscan example. Octopus males are very aggressive when fighting over females. They are seen wrestling and rolling around on the sea floor. In some cases, they have been observed strangling an opponent by cutting off the flow of water to its gills. You can read the 2008 interview with Dr. Christine Huffard, University of California at Berkeley, that details this behavior here. You can also watch a video of the Indian Ocean octopus, Abdopus aculeatus, fighting in the wild over a female here, or another battle (showing some dramatic color changes on the part of the two octopuses) here.